I picked up Bikini Bottom with another Rescue Beauty Lounge order but I think it was during the fall, so it wasn’t the perfect time of year for sheer aqua blue. I think that’s probably what slowed me down. Bikini Bottom is an older Rescue Beauty polish that came out in the “Sponge Bob” collection – it’s named after the Bikini Bottom where Sponge Bob Squarepants apparently lives. This is yet another thing that I learned from nail polish! I don’t have any other context for Sponge Bob. 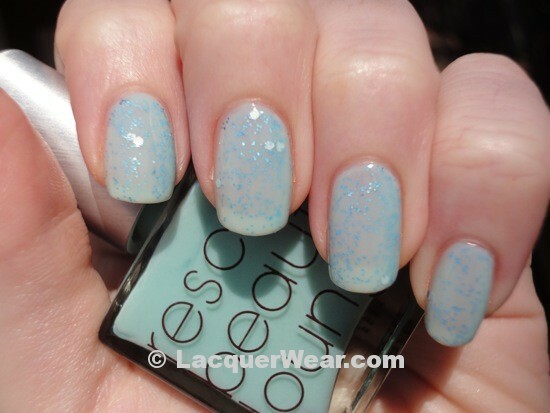 Bikini Bottom is a jelly polish that’s very sheer, with the prettiest light greenish blue tint. It goes on very non-streaky for something so light. I used two coats of Bikini Bottom as a base, then added a coat of OPI’s Gone Gonzo from the Muppets Collection, and finished with one more coat of Bikini Bottom on top. I like how the silvery hex glitters in Gone Gonzo are visible but the little blue glitters just peek out through Bikini Bottom, looking sort of lacy and speckled. Bikini Bottom is sheer enough that it doesn’t cover up the glitters too much, they still sparkle out in the sun. The last time I tried this, I used Essie Marshmallow, which wasn’t really sheer enough to let the glitters show through enough. So this works a lot better. It feels very springy! Rescue Beauty polishes are sold only through the Rescue Beauty website now – the lounge is gone. What a pretty combination! Thanks for sharing your photos.